The city of Olathe is investigating after dozens of headstones were found vandalized. KANSAS CITY, Mo. — A 42-year-old Olathe, Kansas, man was arrested Friday and charged with criminal desecration in Johnson County District Court in connection with the vandalism earlier this week at a city-owned cemetery . Alex Deason faces one court of criminal desecration causing between $1,000 and $25,000 in damage, a felony. He remained in jail Saturday evening on a $3,500 bond. 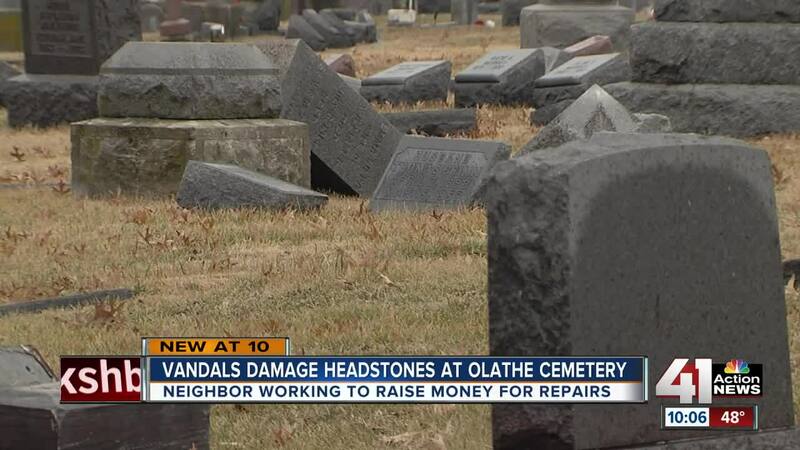 More than 20 headstones were toppled over or broken at Olathe Memorial Cemetery, 738 N. Chestnut St., on Christmas Eve or Christmas Day, according to the Olathe Parks and Recreation. Olathe police, who offered a $1,500 reward for information in the case, announced Friday that a suspect in the vandalism had been contacted. Deason was identified through court records.